A second side booster has left the company's factory. Who needs news releases when you have social media? According to a Teslarati report, last week a Facebook user posted an image of one of SpaceX’s Falcon Heavy side boosters to a Facebook group dedicated to Elon Musk’s space company. In the image, a truck pulls the massive booster eastbound down a road in Arizona — exactly where you’d expect to see a booster making the journey from SpaceX’s factory in Hawthorne, California, to its testing facilities in McGregor, Texas. 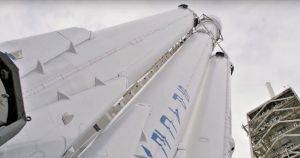 This marks the second side booster spotted in the past month — potentially a sign that SpaceX’s second-ever Falcon Heavy launch is drawing near, despite no official word from the company. Facebook user Eric Schmidt posted his image to the Facebook group on December 3, and on November 9 and 10, other SpaceX followers captured images and videos of the first side booster en route from California to Texas. Teslarati suggests this might mean both side boosters could reach SpaceX’s launch pad at Cape Canaveral as soon as January 2019. If that’s true, we could be mere months away from the second-ever Falcon Heavy launch. An earlier version of this story misidentified the launch pad as belonging to Tesla rather than SpaceX. It has been updated. More on the Falcon Heavy: The Falcon Heavy Launched. Here’s What’s Next for SpaceX.